Counseling of WBJEE 2017 has been started from June 12 and the online registration can be done till June 19 and the fees for the counseling is Rs 500 which non-refundable. The West Bengal Joint Entrance Examinations (WBJEEB) Board was formed for the purpose of holding common entrance examinations for admission to the Undergraduate Level Engineering Courses in the State of West Bengal. It organizes WBJEE for admission into different engineering, architecture & pharmacy courses in West Bengal. WBJEE 2017 was conducted on April 23, 2017 and the result of WBJEE 2017 was declared on June 5, 2017. The process of WBJEE 2017 counseling has been started from June 12. The online registration has been initiated from June 12 till June 19 that includes creating the password and submitting the registration fees. The online choice-filling will continue during June 12- to June 20. Candidates will be able to lock their choice by June 20 midnight and on June 23, first round of allotment results shall be published. Counseling includes registrations, choice filling, seat allotment followed by physical reporting for document verification, initial fee payment, collection of allotment cards at RCs, withdrawal of admission etc. The procedure of seat allotment will be done in three rounds that will held on June 23, July 4 and July respectively. Candidates who have qualified WBJEE 2017 will be offered admissions to as many as 36,288 undergraduate engineering seats as per the official data. Seats will be allotted as per the preferences and ranks of the candidates and those who will be allotted seats are required to report at their allotted institute for document verification and payment of fees. The fees for WBJEE 2017 counselling are Rs. 500 (plus bank charges if applicable) and it is non-refundable. 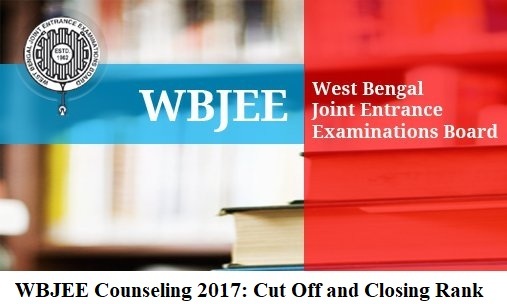 WBJEE Cut Off is the minimum rank required to appear in the counseling of WBJEE 2017. It is closing rank set by WBJEE participating Institutes. WBJEE cut off list varies for different participating institutes and categories. Previous Article How to Start Preparation for JEE 2018 from Class 12th?